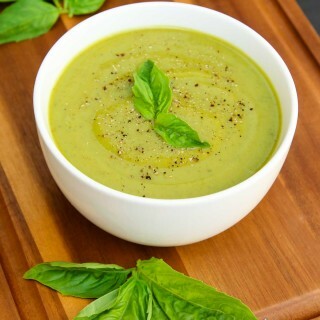 This Velvety Zucchini Basil Soup is a wonderful surprise. All the subtle flavors, the velvety texture, vegan, gluten-free, and only 5 ingredients! In a large non-stick pot, heat 2 tbsp olive oil on medium heat. Add the minced garlic and diced white onion. Saute, mixing frequently, until fragrant and the onions start to become translucent. Add all the chopped zucchini and saute for 1-2 minutes. Add the vegetable broth and 1 teasp salt and combine. Bring the soup to a boil. Reduce heat to keep a gentle simmer, and cover. Let the soup simmer until the zucchini is tender and cooked (to test, simply see if the zucchini easily mashes against the side of the pot). Blend all of the soup until completely pureed. I used my Vitamix, but any blender should do just fine. Most likely you'll have to blend in two batches because of the volume of the soup. While blending one of the batches, add 1 cup packed fresh basil leaves and completely blend/puree into the soup. Add all of the pureed soup back into the large pot and bring the soup to a gentle simmer, uncovered. Cook for an additional 5-10 minutes. The soup should already be at the desired consistency (on the thick side), but for some reason if it is too thin, simmer the soup until you reach the the thickness you prefer. Season with salt to taste and freshly ground black pepper. Serve hot with a side of your favorite toasted bread. For the vegetable broth in this recipe, I used Imagine Brand low-sodium.